WormFax is a summary of WormTest results (in sheep) from around NSW. WormFax is based on sheep WormTest (faecal worm egg count (WEC) monitoring) data from the NSW DPI Veterinary Laboratory at Camden/Menangle (EMAI) as well as from Armidale-based private laboratory, Veterinary Health Research (VHR). Owner details are not disclosed. Some mobs had high WECs. How are your sheep going? If you recently drenched your sheep, do you know if the drench was effective? See, DrenchCheck. Lambex is the biggest sheep-related conference in Australia. The last Lambex, held in Adelaide in 2014, was a sold-out event, with 930 attending, and another 200 missing out. NSW DPI’s Lambex coordinator / Lambex committee member is Tracy Lamb*, located at Cowra. E: tracy.lamb@dpi.nsw.gov.au M: 0408 443 267 (* Yes, she has probably heard all the jokes). It stops egg development (on pasture) dead in its tracks, but doesn’t bother infective stages (3rd stage larvae) on pasture too much. So, yes, you can still get barber’s pole worm problems in winter, especially if you also inadvertently have been using ineffective drenches, and also if your grazing management hasn’t been ‘crash hot’. (It’s hard to be perfect all the time). Barber’s pole worm eggs: delicate like little princesses. It’s L3 larvae: as tough as old boots. Sheep measles (Taenia ovis) was mentioned in the last WormMail. In that edition of WormMail, there was discussion of a survey finding that farmers on average only treated their dogs for tapeworms 2-4 times a year, Dr Patrick Kulver, of the Livestock Biosecuity Network, suggesting that farm dogs should be treated monthly, based on T ovis having a pre-patent period (PPP) of 35 days. (Others say 5-8 weeks) (PPP=time from infection of host until eggs / proglottids appear in the faeces). Several or more years ago it was thought that foxes did not play an important role in Australia as a host for Taenia ovis. from any of the wild dogs examined but T. hydatigena were recovered from 4(8.3%) wild dogs and a single fox. With foxes identified as a definitive host for T. ovis in Australia, new control strategies to stop transmission of T. ovis to sheep need to be adopted”. (Abstract from Jenkins et al 2014). If I read this correctly, and all 499 foxes were successfully examined for T. ovis (and other tapeworms), then 0.2% (2 out of 499) foxes were found to have T. ovis. At the two locations (Jugiong, NSW and Katanning, WA) where T. ovis was found in foxes, more foxes (~ 80-100) were sampled, with one fox at each location (roughly 1% of each sample) being positive for T. ovis. The 2014 Jenkins paper can be accessed by clicking the reference. Red foxes (Vulpes vulpes) and wild dogs (dingoes (Canis lupus dingo) and dingo/domestic dog hybrids), as definitive hosts for Australian Taenia hydatigena and Taenia ovis. (2014) Jenkins DJ., Urwin NAR., Williams TM., Mitchell KL., Lievaart JJ., Armua-Fernandes MT. International Journal for Parasitology: Parasites and Wildlife 3; 75-80. “The article below by Dr David Jenkins of Charles Sturt University Wagga Wagga first appeared in WormBoss News (now incorporated into ParaBoss News). “Foxes, the culprit for high levels of sheep measles in Australian sheep? “Sheep measles is a parasitic infection of sheep occurring as small white masses in meat. The importance of this parasite is that it causes financial losses to the Australian sheep meat industry and is a potential barrier to the international trade of Australian sheep meat. Data collected in the National Sheep Health Monitoring Program (co-ordinated by Animal Health Australia and supported by the Sheep Meat Council Australia and Australian Wool Producers) clearly shows sheep measles to be widespread and often at high prevalence levels in sheep from all sheep producing areas of Australia. “During the last two years, Meat and Livestock Australia (MLA) funded a two-year study charged with determining why sheep measles is so common, revisiting the life cycle, identifying on-farm risk factors and then determining the financial impact on processors. “The sheep measles parasite, Taenia ovis, has a two-host lifecycle with a different body form in each host. Large tapeworms (up to two metres) occur in the intestine of dogs and small cysts about the size of a small pea grow in the muscles of sheep. Mature tapeworms in dogs produce thousands of eggs that are shed daily into the environment via the faeces of infected dogs. These eggs are accidentally ingested by sheep whilst grazing. They hatch in the sheep releasing microscopic 6-hooked larvae that exit the sheep’s intestine, enter blood vessels and are passed to the muscles. Here, over two months, each develops into a cyst containing a tapeworm head. If these cysts are eaten by a dog (via the infected meat), the dog becomes infected with a sheep measles tapeworm. “Sheep measles does not infect humans, in contrast to its closely related cousin the hydatid tapeworm (Echinococcus granulosus), and it appears to be of no veterinary importance to either dogs or sheep. Its importance is all down to aesthetics associated with the presence of cysts in meat for human consumption. Cysts in sheep remain infective to dogs for 2–3 months after which time they are killed by the immune system of the sheep, developing into a small pus-filled abscess. These abscesses become mineralized transforming into a gritty masses, evolving to hard calcified nodules that remain in the muscle for the life of the sheep. None of these manifestations is popular with consumers! “The MLA sheep measles study was undertaken in WA, NSW and Tasmania. These states were selected since abattoir infection data regarding sheep measles identified high prevalence in WA, medium levels in NSW and low levels in Tasmania. In addition, from a potential for wildlife involvement, Tasmania is wild dog and fox-free*. “About 100 producers were involved in the study, about two thirds with a sheep measles problem and one third without. We also undertook financial impact studies in 5 abattoirs (3 NSW; 1 WA; 1 Tasmania). Abattoirs killing mainly lambs suffered the lowest losses but mutton abattoirs in NSW were losing about $1,100/day whilst in WA losses averaged $2,200/day with peaks up to $4,000/day. Losses for individual producers are often unexpected and substantial. One producer in this study lost $4,000 on two consignments of lambs sent for slaughter in 2012. “We found no identifiable on-farm risk factors pre-disposing farms to having sheep measles. We examined the faeces of 245 farm dogs and found only one infected with tapeworms. Coincidently, these turned out to be T. ovis in a dog from a farm in Tasmania. The low level of tapeworm infection in dogs is the likely result of the common use of dry dog food and wide availability of relatively cheap all-wormers for dogs containing the highly efficient tapeworm-killing drug praziquantel. We concluded that domestic dogs may not be the major source of infection for sheep now, as they once were in the past. “We examined the intestines of 499 foxes and 52 wild dogs. We found T. ovis in two foxes (one from NSW and one from WA). The sample sizes of foxes collected from the various locations were variable. The two infected foxes were recovered from the localities where the largest samples were collected, equating to a prevalence of about one percent in each location. Although not high, given the fact eggs of T.ovis remain infective on pasture for at least 300 days and foxes are highly mobile covering anything from 4 to 16 km/night, only a few infected animals need be present in a given geographical area to maintain high exposure pressure on the local sheep population. “Of the 52 wild dogs examined none was found infected with T. ovis, however, this may be a reflection of the small sample examined. Nevertheless, there was no doubt some wild dogs had been consuming sheep because T. hydatigena tapeworms (bladder worm) were recovered from 4 (8.3%) of the animals. We also identified two foxes infected with T. hydatigena. “Our study showed for the first time that foxes in Australia are able to act as hosts for T. ovis tapeworms, providing an additional (important?) source of infection to sheep. These findings highlight the need to modify current sheep measles control strategies. This does not mean abandoning de-worming of dogs and feeding safe foods; this should continue as it has been highly effective, but we need to consider how we can protect sheep. Although a little repetitive, following are some points from my notes. (See the notes for references, more detail etc). Prevalence of sheep measles (T. ovis metacestodes / Cysticercus ovis). Based on National Sheep Health Monitoring Program (NSHMP) data, sheep measles is common and widespread, but varying between regions. At least it’s relatively common for lines of sheep inspected under the NSHMP to have at least one sheep with ‘measles’. However the proportion of individual animals affected is somewhat less, around a few to several percent. (It varies). But, there are occasional cases which perhaps reflect ‘Ovis storm’-like conditions. For example, in one case I recall, 400 lambs were sent to an abattoir in NSW, 100 of the carcasses were condemned or severely trimmed because of sheep measles (B McLeod, pers comm). As to inspections under NSHMP: about 3 million sheep (incl. lambs are inspected per year, which is about 10% of the sheep (incl. lambs) slaughtered in Australia. Also, two of the bigger mutton processors in NSW (Dubbo, Goulburn) are not part of NSHMP. So, we need to be careful when interpreting results from the program. However, some mutton processors not currently involved in NSHMP were part of the study (on costs to processors) by Jenkins et al, 2014. Prevalence of adult T. ovis tapeworms. The definitive (final) hosts are canids: domesticated and wild dogs, and foxes. Theoretically cats could (very) rarely be infected, but it’s highly unlikely these infections would be patent (i.e. shedding eggs onto pasture). T. ovis has never been reported in feral cats in AU or NZ. Jenkins et al opine that foxes are more important now (in mainland Australia) in the spread of T. ovis than domestic dogs, with the role of the latter seemingly declining in importance in recent decades. Apparently not all agree, for example, Palmer, in Western Australia. Even if foxes are now more important, it seems, on current evidence, that even the prevalence of infected foxes is quite low (and probably variable), possibly (?) around the 1% mark (?). Fecundity of T. ovis. T ovis is fecund, with about 3 segments being shed per day, each segment containing about 60,000 – 80, 000 eggs. According to “NZ”: one T. ovis tapeworm can produce 250 000 eggs/day and some dogs can carry 3-4 T. ovis tapeworms. Compare this to say Haemonchus (about 5-10 000 eggs/female/day) and Fasciola hepatica (about 20,000 eggs/fluke/day). But, dogs with T. ovis have perhaps 1-4 tapeworms. (But, they are up to 2 metres long!). The numbers of adult Haemonchus and Fasciola carried (in sheep etc) can be in the hundreds to thousands. On the other hand, just a few T. ovis cysts in a sheep can be economically important, even without health consequences to sheep/goats or humans. Spread of T. ovis eggs. The eggs on pasture are infective to the intermediate hosts, sheep/goats. These can be spread far and wide by free-ranging wild canids (foxes and wild dogs), but are further spread by wind, rain and coprophagous flies. (‘No accounting for taste). Viability of eggs on pasture. Jenkins et al says eggs can be viable for 300 days or more, whereas ‘NZ’ (see notes) say they can be viable for 6 months, but more likely around 4 months (but some can last 18 months), depending on conditions. (Infective stages of H contortus (L3 larvae) and F hepatica (metacercariae) are viable for weeks to several months (and even more) depending on temperature in particular). More on immunity…”Exposure to T. hydatigena suppresses infection by T. ovis, but not by E. granulosus. This has important epidemiological consequences where these parasites co-exist.” (Gemmel et al Parasitology 1997. See notes). Control. Traditional control consists of preventing dogs from consuming sheep meat/offal containing viable cysts, and regular treatment with a tapewormer (praziquantel is the most effective) to remove T. ovis from the dog’s intestines. Given the role, according to Jenkins et al, of a sylvatic pathway, with foxes in particular playing a part (in mainland Australia), traditional control measures, while necessary, are insufficient, the authors say, and vaccination of sheep against T. ovis is necessary. T ovis vaccine. A Melbourne-based group (Joh or TAS?nstone et al) in 1989 reported on the development of a T. ovis vaccine and this was subsequently commercialised and marketed in NZ, but then went off the market. Jenkins et al, 2014, comment on possible reasons for this. Theoretically the sylvatic cycle (apparently not an issue in NZ? or TAS??) could be interrupted to some extent by using cestocide-laced baits (trialled in Germany) but this would be impractical in countries like Australia. Jenkins et al much prefer the use of a T ovis vaccine to augment traditional control measures. More on vaccines…”Highly effective recombinant vaccines have been developed against the helminth parasites Taenia ovis, Taenia saginata and Echinococcus granulosus. ” Lightowlers et al Vet Parasitol 2003 (See notes). Resistance to praziquantel (PRZ)? To control T.ovis with its pre-patent period of 35 days (others say the PPP is 5-8 weeks), monthly treatment of rural domestic dogs has been recommended. This is logical to optimise control, but on the other hand, it may increase selection for resistance. However, I know of no cases of taeniid tapeworm resistance to PRZ, although I am aware of reports from NZ of Monezia app resistance to PRZ. There is discussion about PRZ resistance of Schistoma (blood-flukes), but I gather it is not currently considered an issue. More information, and modelling, needed? My impression is that there is still a lot to be leaned about the ecology, epidemiology and economics of T ovis / sheep measles, at least in Australia. As to the role of various definitive hosts, although quite a few dogs and foxes have been examined over the years in Australia, it seems to me the numbers are inadequate to result in reliable estimates of prevalence. I wonder also if modelling may help to better understand the epidemiology of T. ovis in Australia. (On the one hand, T ovis is fecund (but each dog/fox has few tapeworms) and the eggs are viable for several months, but then the prevalence of T ovis in definitive hosts seems to be low, and also the cysts in intermediate hosts are only viable for 2-3 months.. But then it doesn’t take many cysts in a sheep or goat at an abattoir to make a case significant economically……) – SL. ‘Australian scientists will be field testing their ground-breaking breath markers for malaria, thanks to a $1.4 million research grant from the Bill & Melinda Gates Foundation.’ Link to article. (Paraphrasing Mark Twain): I was going to write a short WormMail, but I didn’t have time, so I wrote a long one instead. Did you use an ineffective drench when weaning cattle ? DrenchTesting – how high do the egg counts need to be ? You just weaned and drenched young cattle – did the drench work? About this time of the year many cattle are being weaned in south-east Australia, including NSW. This will include weaners getting a drench, certainly in higher rainfall areas, for example, the eastern third of NSW. This drench will likely be a broad-spectrum drench and in some cases a fluke drench as well. In many, perhaps most, cases the broad-spectrum drench will not be highly effective. And, more often than not, the producer will be unaware of this. How can I say this? Well, recent surveys have shown that resistance of cattle worms to drenches is quite common in Australia. Furthermore, relatively few cattle producers have checked the efficacy of the drenches they use. In one recent survey of around 30 cattle properties, most of them in NSW and Victoria, at least two-thirds of the farms tested had resistance to at least one of the macrocyclic lactone (‘mectin’, ML) actives in cattle drenches on the market in Australia. But, it’s not just about the mectins. All the important cattle worms (Ostertagia, Cooperia, Haemonchus) have developed resistance and all the broad-spectrum drench groups on the market are affected to a greater or lesser degree. It varies farm by farm. 1. Assume you have resistance to at least one of the broad-spectrum drench groups. 2. Assume it is economically important. 3. Find out what drenches work on your property. ‘DrenchCheck’ is an easy way to begin. This means doing a worm egg count on or just before drenching a mob or group of cattle. Re-test the cattle 14 days later (as opposed to 10-14 days, as in sheep). Ideally get a worm-type (larval culture) done as well as an egg count. If checking efficacy of fluke drenches, do a fluke egg count on the day of drenching and again 21-28 days later. Drench resistance test – how high do the egg counts need to be? This covers all practicalities, including the questions asked in the heading above. Labs generally calculate the drench efficacies for you. In addition, the NSW DPI State Vet Lab (EMAI, Camden/Menangle) also calculates 95% confidence limits. This seems like a useful guide to me. However, there is a small error (perhaps already corrected) regarding Barbervax: “It requires two priming injections, followed by 6 weekly injections over the course of the barber’s pole season”. In fact, in sheep not previously vaccinated with Barbervax, 3 injections 3-4 weeks apart are required for ‘priming’, followed by boosters every 6 weeks while protection is required. It’s important to follow the guidelines for Barbervax: as an esteemed colleague said, “Barbervax is actually a Haemonchus control program not just a vaccine (i.e. it works best with grazing management coupled with the occasional drench and has to be given at specific times)”. “A recent Meat and Livestock Australia survey has revealed farms across Australia are not worming working dogs regularly enough to stop the spread of costly sheep measles. With the role of the farm dog on properties yet to waver, the responsibility to monitor and maintain their health continues to be a top priority for business management plans. “There are three dog tapeworms which have a life cycle that includes sheep: hydatids, sheep measles and bladder worm”, Dr Kluver said. “The old recommendation for controlling hydatids of worming every six weeks is probably also too long for effective sheep measles control,” he said. He added that economically, the most important disease to control is sheep measles, given it affects the majority of properties in all sheep regions in Australia with an estimated cost to the sheep industry of millions of dollars every year. 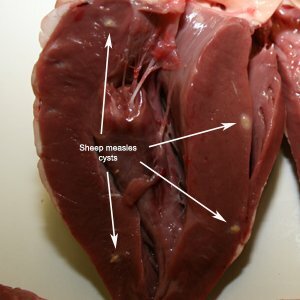 However, as Jenkins concludes (2014; see link below): ‘Since foxes have been conclusively shown to be definitive hosts for sheep measles tapeworms, conventional sheep measles control strategies, namely, regularly deworming farm dogs and preventing them eating uncooked or unfrozen sheep meat or offal (hearts) are inadequate to prevent the transmission of ovine cysticercosis. These traditional control activities should not stop but will need to be complemented with directly protecting sheep from infection through vaccination.’ He then goes on to recommend commercialization of a vaccine. You may have seen this piece at “Beef Central”, which cites hydatids expert, Dr David Jenkins, who will be presenting at the AVA Conference on this subject in May (this month). (Thanks SionAron). PAPP (para-aminopropiophenone) works by inducing methaemoglobinemia (resulting in reduced oxygen carriage; hypoxia). Antidote = methylene blue. A common cause of methaemoglobinaemia in livestock is nitrite poisoning, but other oxidants can be involved. The last time I used methylene blue was in diary cattle that had nitrite poisoning from grazing Sudax. (Clinical signs: severe dyspnoea, grey-blue to brown mucosae and blood, c.f. the brick red mucosae seen in cyanide poisoning). We saved quite a few using methylene blue. Apart from the clinical signs, a memorable feature was the blue urine following treatment. ‘Our new website was activated last week and not only looks great but has some new functionality to make using it easier. We are creating a new, modern site through which we can interact with our stakeholders, communicate our vision and build our reputation’. Here is the article on virtual fencing, and also on upright shearing platforms. (I am not sure how long these links to Sheep Central will be alive). (Simplistic references to ‘bad cholesterol’ are unfortunate). You’ve all seen them. QR means ‘quick response’. 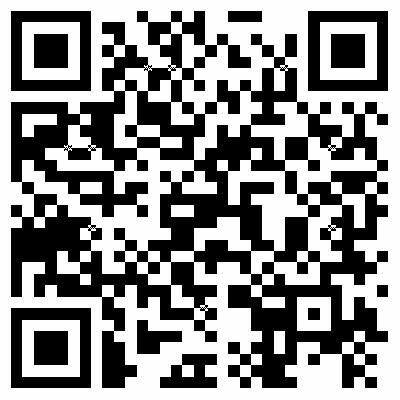 There is a message in the QR code above. In last week’s Federal Budget, our leaders cut Australian aid to its lowest ever level. And apparently this usage goes back to 1769, or earlier (although I find this usage literally annoying). Time: some spend it, others invest it. Secrets: three can keep a secret, if two of the three are dead.